The DTS-Houston campus was approved as an extension site in 1993. It became a full campus in 2005 after earning accreditation from the Association of Theological Schools to offer the complete Master of Theology (ThM) and Master of Arts in Christian Education (MA/CE) degrees. The Dallas Theological Seminary is proud to serve the students at the Houston campus. Available for men and women in sizes Small - 2XL. 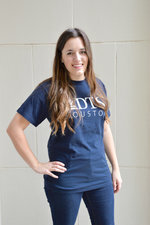 100% Cotton T-Shirt features DTS flame and seminary name in white lettering. Beautifully etched mug in a purple matte finish. 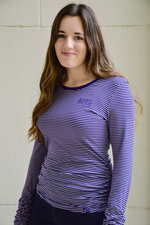 This is a beautiful long sleeve t-shirt in dark and light purple stripes that includes the DTS Houston logo. 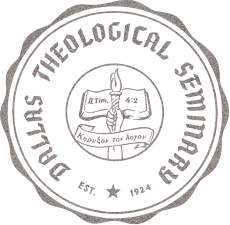 It is t 95% Cotton 5% Spandex. Machine washable.